One of the best episodes in years uses a mature depiction of culture shock to provide ample depth to its breakout character, Koda. Summary: One of the best episodes in years uses a mature depiction of culture shock to provide ample depth to its breakout character, Koda. Koda dreams of his old life, where he found the Energem and then saved his brother from a Saber-Toothed Tiger, falling to his presumed death in the process. He’s awakened by the revving of the new Dino Cycle, which sounds very close to the growl of the Tiger, terrifying him. Meanwhile, Sledge sends a new monster down, Slammer. After Koda talks about his fears and inability to incorporate himself with the technology of the present day, Slammer attacks and captures them with a boy named Peter in impenetrable cages. However, the way the cage fell onto Peter’s bike caused it to be broken and have a small opening, enough for Koda and Peter to escape. Koda uses his caveman instincts to make it far, and Peter offers him the GPS on his phone to help him make the rest of the way. After realizing their teammates are missing, the other Rangers search them out, eventually finding a cave that’s surrounded by an energy barrier blocking their powers and communications. Koda makes it out and fights alongside the Rangers to defeat Slammer. Riley calls on his Raptor Zord, which attaches to the Megazord while the Tricera Zord rescues Chase. Together, they are able to destroy Slammer. Afterwards, Koda finds Peter and gives him a new bike, and Peter offers to teach him to ride it. I’m going to go out on a limb here and say that “Return of the Caveman” is the best, or at least most solid, episode of Power Rangers in years, perhaps since somewhere during RPM. That’s not to say there weren’t winners scattered throughout the Samurai and Megaforce seasons, but little has mirrored the amount of depth and structure “Return of the Caveman” presents in quite a while. The first few episodes of Dino Charge have been incredibly promising, but were necessarily restrained because of their place as introductory episodes. Something like “Past, Present and Fusion” will play differently depending on how the rest of the season pays it off. “Return of the Caveman,” conversely, is the first time we see Dino Charge free of Power Rangers-y exposition and set-up, instead squarely focused on a central character and a singular story. The last universally praised season, RPM, also utilized the flashbacks for character backstory, but it was par the course for that season’s “After the End” theme. Dino Charge is only using it because it helps present some of the bigger scale backstory this season has, and it does so by totally owning filmmaking’s cardinal “show, don’t tell” rule. What works so well about Koda’s flashbacks are their brevity. Unlike RPM’s Lost-style of flashback storytelling, Koda’s flashbacks aren’t so much a story as a reference-point, one better told visually. And man, is it effective; the episode waits to confirm that the boy in Koda’s flashbacks is his brother until the exact right moment when Koda earns little Peter’s trust, and it’s a whammy. We don’t know exactly what happened to Koda after that fall, but it’s evident that it was the last time he saw his little brother, and those are some heavy implications. It’s wonderful that the show isn’t just going to brush over the fact that all of Koda’s family and friends have been dead for thousands of years, and is rightfully using it to deliver some well-earned emotional storytelling. Yoshi Sudarso, who is an immediately charming individual all over social media, owns the role of Koda. We’ve seen him nail the physical comedy already — Koda walking into the glass might be funnier than any gag Power Rangers has done in the last four years — but he gets to up his game substantially this week. Sudarso conveys a wealth of emotion in very, very few words, no small feat for any actor. It helps that up until now we’ve only see Koda be fun-loving and generally warm, thus putting that established demeanor up against the more determined or terrified moments Koda has this week. But even at that, Sudarso has the charisma to carry his own show, if he had to — on this episode alone, I’d be content with a spin-off all about “Koda the wandering caveman superhero in the present.” That said, having him on a team and striking up fast friendships with the likes of Chase, who may as well be his polar opposite, only makes Koda more charming. He’s “simple-minded” compared to our slightly more evolved brains now, technically, but he’s incredibly self-aware and not childlike. That so much of this episode deals with Koda’s admission of his lack of self-worth and fears — not of technology itself, but the more complex fear of his lack of understanding of it — goes much father than typical “funny caveman” jokes the show could be doing. We know Chase and Koda have a bond just by being the first two Rangers of the team, but that they’re both cultural outsiders in (what’s implied to be) America is a special kind of bond. And there’s the fact that an Indonesia-born actor was cast in a type of role that, for some reason, is almost always played by a white guy (which, let’s face it, assuming most cavemen were white makes absolutely no sense at all.) There’s an argument out there that casting someone of Asian descent in a role that involves broken English has unfortunate implications, but Dino Charge seems to be playing it in the most sensible way possible — not to mention that Sudarso has already proven himself to be perfectly cast in the role, anyway. More to the point, while we’ve occasionally had “culture clash” episodes, or an analogue in alien characters, “Return of the Caveman” digs into the decreasing confidence and isolation someone who lacks communication or certain cultural skills would face. Koda thankfully doesn’t have someone yelling at him to “Speak English because this is America!”, but even with a welcoming group of friends, he still has to have people speak for him or translate body language most of the time. The engine of a motorcycle that seems cool to everyone else essentially gives him PTSD — an incredibly mature character beat — and shows just how scared he is even in his comfort zone. And then Koda thrives when he’s thrust back into his own home-like environment, immediately regaining his self-confidence and making his way out more swiftly and easily than any other of the Rangers could. Simplistic as this episode’s story is, it hearkens to a rather profound ordeal plenty of people who emigrate go through, nicely laid out back in a recent episode of Modern Family, oddly enough — as stupid, weak, and vulnerable some people seem when they’re struggling in a brand new culture, stripping the language and culture barriers would show that they’re just as smart and strong as their current peers. Koda doesn’t have to deal with prejudice or anything to that extent, but the episode uses typical Power Rangers plot devices to deliver the most basic and comprehensible versions of those feelings of inadequacy, and why it’s so important to retain that connection to your original culture. The episode doesn’t just stop there, though. It’d be easy to boil things down to “caveman instincts help you get out of caves,” but the presence of Peter throws in an even more complex little lesson here. First of all, the little actor that plays Peter is easily one of the best child actors the show has scored, after a very, very long list of painfully awful child actors. And his presence as a parallel to Koda’s brother makes more sense than many seasons’ shoehorning in of kid characters. Really, everything about Peter works; his bike breaking the cage is a clever plot device, and the fact that a child breaks his leg when kids’ shows normally have to shy away from endangering children too much is very ballsy. But more importantly, Peter’s use of technology — his phone can get a GPS signal but not phone service, which I’m not sure is possible, but I won’t fight it — plays a key factor in Koda’s rescue. Essentially, while Koda is an outsider in this culture, it doesn’t mean he’s completely incapable playing a part in it; he’s adapted to being a Ranger after all. The key, though, is that he has to be able to retain aspects of both worlds. You can’t and shouldn’t ask someone learning English to completely drop their first language, and Koda can never stop being a caveman. But he can utilize the strengths of both his new and old worlds at the same time, retaining confidence from his connection to his origin and continuing to persevere in this new one. That makes Koda a pretty darn strong Ranger overall, and lets him completely earn his incredibly badass slo-mo walk out of the cave with Peter in his arms. In general, Koda is one of the better and more creative characters the show has produced in a long while. And that’s probably why “Return of the Caveman” is such an engaging episode — like Koda, it’s simple and straightforward on paper, but the true depths and layers granted by the situation are nothing short of surprising. Not bad for a caveman. I love Dino Charge, but between the dinosaurs in episode one and the saber-toothed tiger this week, they might want to take a step back from the CGI prehistoric creatures, or at least do it in darker lighting or something. So, we have to get an episode where Shelby and Kendall are forced team-up by themselves, right? I love the offended look Kendall shoots at Shelby upon not getting called “Ms. Morgan.” The realistic balance of camaraderie and causticness in this cast is extremely well-played. Why do the Dino Cycles need two energy scanners? Curious to see where this “new friend” for Poisandra (apparently named Curio) goes. Also, Sledge and Poisandra are super, super cute, even if he wants her off his back. But seriously, dude, it’s 65-million-year-engagement…can you really blame her for being a little naggy sometimes? The rampant talking during the fight sequences that plagued Megaforce is still present in this episode, but it’s much less noticeable when surrounded by a really good plot. We also have the weapon/Zord-announcement narration like we had in Megaforce and Mystic Force, for some reason. There was some justification for it in those seasons, but it’s a little strange here. 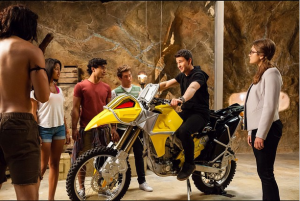 Riley (kind of randomly) gets to use his Raptor Zord this week, which is cool. But even cooler is that Tricera Zord single-handledly busts in and saves Chase, which is awesome. So even when her Zord isn’t attached, Shelby is still hanging out in the cockpit. Hey, it’s a cool design, so I would too! Nic Sampson, the Mystic Force Yellow Ranger, voiced the Slammer monster. He’s voiced monsters in seasons past, too. That’s pretty cool!